This sauce tastes just like you'd find in a wonderful Greek restaurant. It's simple to prepare- just plan ahead and make it a day before you're planning to eat it. 1. Start one day ahead: Prepare yogurt cheese: Spoon yogurt into a large coffee filter or a cheesecloth-lined strainer; set over bowl and let stand in the refrigerator 2 hours or overnight. Discard the liquid. The solids that remain are the "yogurt cheese." 2. 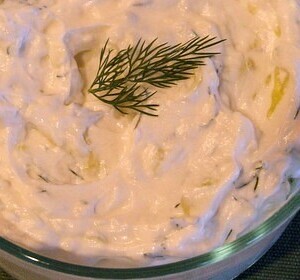 Combine yogurt cheese, cucumber, garlic, oil, dill, lemon juice and salt in a bowl; mix well. *The flavor in Tzatziki sauce improves with time. Try refrigerating it a day or two before serving so that the ingredients have a chance to blend. 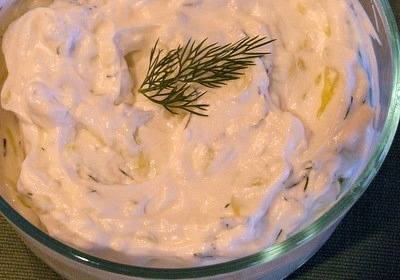 *Serve with grilled pork, lamb or other meats -or as an appetizer dip with fresh vegetables for dunking.